The NRA is accusing New York Gov. 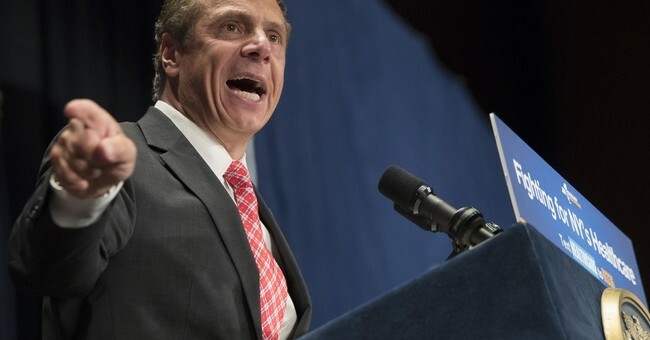 Andrew Cuomo (D) of trying to "deprive" them and their constituents of "their First Amendment rights to speak freely about gun-related issues and defend the Second Amendment" in a new lawsuit. In April, Cuomo directed state regulators to "urge insurance companies, New York State-chartered banks, and other financial services companies licensed in New York to review any relationships they may have with the National Rifle Association." The governor's part in encouraging these entities to end their partnerships with the gun rights organization did much to hurt their finances, the group alleges. At the same time, Defendants engaged in back-channel communications to reinforce their intended purpose. Simply put, Defendants made it clear to banks and insurers that it is bad business in New York to do business with the NRA. As a direct result of this coercion, multiple financial institutions have succumbed to Defendants’ demands and entered into consent orders with DFS that compel them to terminate longstanding, beneficial business relationships with the NRA, both in New York and elsewhere. These "abuses" will "imminently deprive the NRA of basic bank-depository services, corporate insurance coverage, and other financial services essential to the NRA’s corporate existence and its advocacy mission." Cuomo didn't seem too concerned with the charge. If the @NRA goes bankrupt because of the State of New York, they'll be in my thoughts and prayers. In a statement, Cuomo called the lawsuit "a futile and desperate attempt to advance its dangerous agenda to sell more guns." "In New York, we won't be intimidated by frivolous court actions from a group of lobbyists bent on chipping away at common sense gun safety laws that many responsible gun owners actually support," the governor said. "I am proud of my 'F' rating from the NRA, and I will continue to do everything I can to keep New Yorkers safe." Cuomo is infamous among gun owners for signing one of the most anti-gun bills in the country in 2013, shortly after the shooting at Sandy Hook Elementary School. New Yorkers protested the legislation, dubbed the SAFE Act, en masse. The bill, which banned the sale of AR-15 semi-automatic rifles, resulted in over 1,200 felonies in the first year.